Anyone ever see this place? 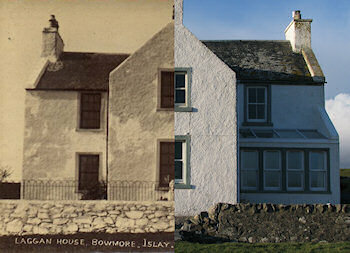 It's my Grandmothers old family home and it's somewhere near Lagan at Bowmore Islay. He also left a link to his family history page with several old pictures: A Brief History of Mine. Paul commented saying that he was going to be on Islay in January and could take some pictures if we could tell him where to go. Google to the rescue: Laggan Farm, Bowmore, Isle Of Islay PA43, UK. Armed with this information Paul went to Islay. I hope you like the pictures and find the comparison interesting. Many thanks to Paul again for his help! If you have any further information please leave them in the comments.